What Can a DVD Ripper Do? A DVD ripper is usually used for copying the audio and video content of a DVD to a file encoded in AVI, MP4, MPEG, MKV or other video formats. The ripped file saves in a hard disk or other media device for further editing, backup, sharing or playback without the need to load a DVD. I find it’s really hard to say which one is the best(listed in no particular order). Perhaps A supports numerous outputs. But it only rips part of the protected DVDs. Maybe B is powerful enough to rip the latest protected DVDs. However, the features are difficult to understand for beginners. Hence, we listed the advantages and disadvatages of each DVD Ripper, and hope it helpful for you. Advantage Handbrake transforms your DVD to an MP4 file which is compatible with a wide range of media players. It also supports ripping DVD to a MKV file. A very great feature is Handbrake is designed with preset profiles for Apple iPhone, iPad, iPod, Apple TV, Android and WP8. Moreover, it provides numerous video and audio parameter settings for users to alter file size and video quality. Slow speed in transcoding. It doesn’t rip protected DVDs unless you pair it with third-party tools. Support nearly all video file formats. Convert DVD to video files. nike air max 2017 pas cher Burn DVD/Blu-ray. Step 1. nike air max 2016 wit Load DVD movies Insert the DVD disc into your computer’s DVD drive and run DVD Ripper. You can click the “Load DVD” button to load the DVD files to the program. DVD ISO/IFO, VIDEO_TS folder are supported also. Step 2. Specify output format You can just select “Common Video” > “H.264 High Profile Video(*.mp4)” or choose “HD Video>H.264 HD Video (*.mp4)” as the output video format.Or find more profiles yourself. Tips: Before the conversion: 1. You can click “Edit” button to edit your movies by cropping, trimming, adding watermarks, etc. 2. You can choose the subtitles and audio track for the target video from the “Subtitles” and “Audio” options on the main interface. 3.If necessary, you can click the Settings icon to adjust the video size, bitrate and frame rate, audio sample rate and bitrate, etc. Keep in mind higher bitrate results in a bigger file size. Step 3. Start Ripping DVD When all these settings are ready, you can click the “Convert” button to begin ripping DVD. When the ripping is done, you can click on “Open” button to locate the ripped videos. Directly Copy a DVD with . vob Files Only (larger size of memory, 5 GB for a common DVD movie) Step 1: Same as the Guide > Step 1. Step 2: Choose “Copy” > “Directly Copy” from the Format menu to copy the . vob files only. 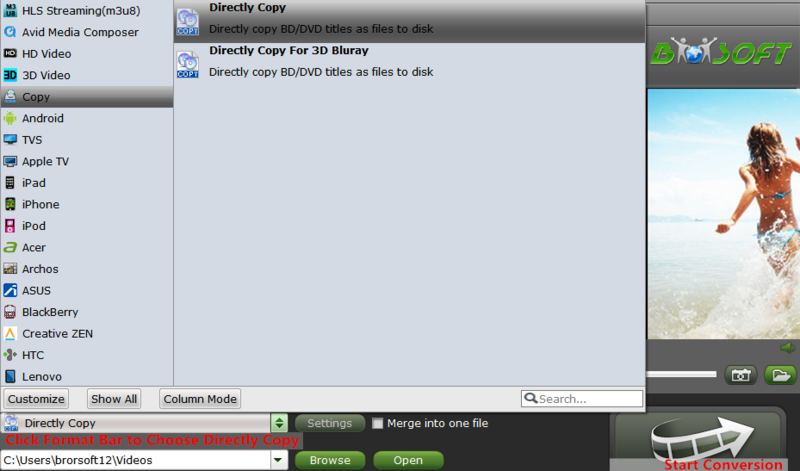 Step 3: Click the “Convert” button to start Directly Copy a DVD with .vob files only. When the copying work is done, you are able to click “Open” button to get the output .vob files without any other extra contents. Step 1: Same as the Guide > Step 1. Step 2: Click “Browse” button to select a destination folder for the output files. Step 3: Click quick button “Copy the entire disc”(picture in guide > step 1> pic) to starts copying the DVD files to hard drive maintaining the original structure. As soon as the copying task finished, you can click “Open” button to get the output videos.